There are tons of badges and patches out there - but how can you earn them? We're sharing ideas on how troops have earned badges and fun patches that might inspire your girls. Do you have ideas to share? Email the communications team. 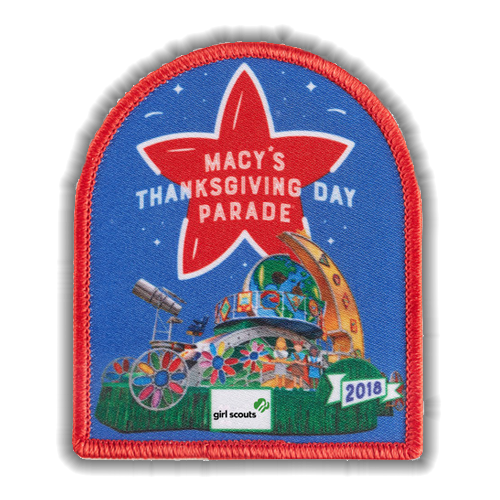 This year, Girl Scouts’ “Building a Better World” float will return to the annual Macy’s Thanksgiving Day Parade®, where we’ll celebrate girls building a better world through STEM (science, technology, engineering, and math). Invite your girls to earn a FUN patch by filling out this questionnaire, turn it in to their leaders, and leaders can order patches from the Girl Scout store for all girls who complete the activity! Tune in to the 92nd Annual Macy’s Thanksgiving Day Parade, airing nationwide on NBC, Thursday, November 22, from 9:00 a.m. to noon across time zones. Today the Girl Scouts of the USA still offer participation patches for ability awareness and inclusion. The requirements vary from one local council to another, but they may be completed by scouts at all levels from Daisies to Ambassadors. Depending on their rank, the scouts must select up to 9 activities from a menu in order to earn the patch. The Flag Ceremony Service Patch can be a great acknowledgement that your troop respects the American Flag. Especially appropriate for Flag Day activities or patriotic holiday events.